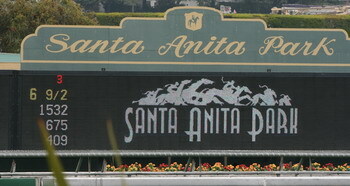 Comes winter time, Santa Anita Park, the oldest horse track in California, opens. 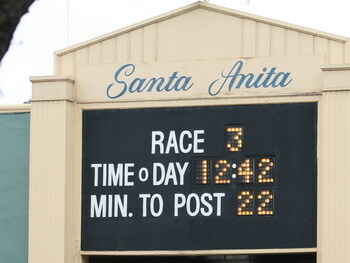 The track is considered to hold the best racing in the country during the Winter-Spring Meeting. 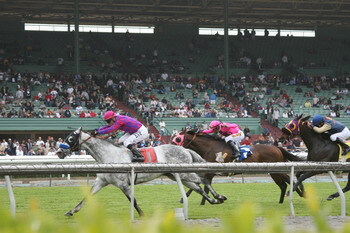 Even without knowing that, any trip to Santa Anita is fun and highly entertaining. I love art deco buildings. I was fascinated with Miami. 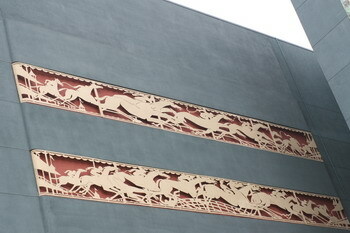 We have a lot of Art Deco architecture in Los Angeles, besides the obvious landmarks, that is. Unfortunately we also lost a lot of those buildings, they had to make room for bigger and better things; although I would gladly trade some to the “bigger” and “better” for the old stuff. 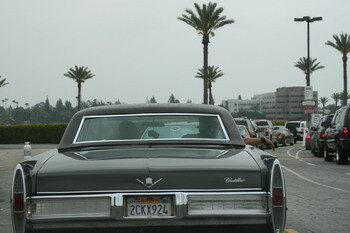 One example is the “Miracle Mile,” a stretch of Wilshire. Amazing buildings can be seen there. Different from what one sees in Miami, not quite as colorful, but the whole stretch holds one aesthetic surprise after the other. In our area here one can walk around and pinpoint exactly how the quarter grew, just by looking at the houses: from Craftsman Style to Streamline Moderne, with Bauhaus influences and “Spanish Style” mixed in between. Plus there are “our” Frank Lloyd Wright- and Neutra-houses. Not everything is pure style-wise, but one can see how motifs were picked up and incorporated. Our house, for example, has strong Streamline Moderne style influences with the odd porthole window and rounded contours – no wonder, it was built at the end of the 1930s. At that time this style was all the rage with the film community (and our area too), lots of film stars lived here in their appropriately modern houses. Interestingly enough one does not find Art Deco single residences here, only larger buildings (apartment houses and such) were built in this style.